When Jem and the Holograms aren't out performing they're relaxing. And because there's a good variety of members affiliated with the group, that relaxation takes on a variety of different forms. In Jem and the Holgrams: Dimensions #1 from IDW Publishing, two of those forms are on display. "Catnap" is written and illustrated by Sophie Campbell, colored by M. Victoria Robado and lettered by Shawn Lee. "Roll With It" is written by Kate Leth, illustrated by Tana Ford, colored by Brittany Peer and lettered by Lee. 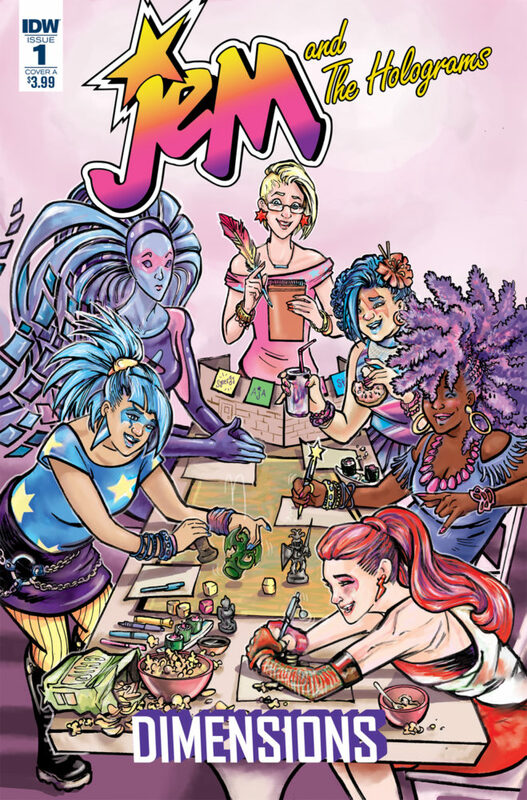 Jem: Dimensions brings both new and beloved creators to the world of The Holograms! In "Roll With It," the Holograms throw a Dungeons and Dragons game night with Jerrica as the Dungeon Master, and even Synergy joins the fun! And in "Catnap," the Misfits (plus some NEW faces) take a break to go on a ski trip, when all hell breaks loose…and so does Pizzazz’s cat! Both stories in the issue emphasize the camaraderie found within Jem and the Holograms without relying on the big players to convey that sense to the reader. In "Catnap," Clash is tasked with taking care of Madmartigan the cat and Campbell inserts a certain amount of drama in the way of Graphix, Video and Shade--their inclusion keeps the action in the issue moving very well. The dialogue exchanges between the two sides is engaging and entertaining, with Campbell including the right amount of sassiness and strength in response to make their rivalry believable. In "Roll With It," Leth takes the tried and true D&D night and spins it by giving Jerrica a role that's not really hers by choice in a DM. The story from there fits well with the personalities of the other characters--especially Jerrica--before the group comes together in a display of unity and start having a fun time when there's less pressure to be who they really are. Campbell also handles the illustrative duties in "Catnap" and her style is very clean and refined. The exquisite linework pays particular attention to the facial details of the characters as Campbell relies on a sharp, angular style to convey the intensity of the chase. Robado's colors are bold and vivid and befit the Jem and the Holograms style while the panels are fast and furious to keep up with the pace of a downhill ski chase. Ford's illustrations in "Roll With It" are very similar to Campbell's illustrations with the biggest difference being that Ford prefers softer edges for her character models. The style plays better with the D&D dynamic in that when the characters take on the appearance of their avatars it fits well. Peer's colors in the story are just as vibrant as Robado's in the other, although Peer does skew a littler darker and more neon. Jem and the Holgrams: Dimensions #1 is really enjoyable and shows many of the characters in the universe somewhat taking a break from the grind of performing on the road. Both stories come together very well and offer the right amount of drama for short stories. Campbell's script and illustrations in "Catnap" are frenetic and reinforce the notion that a ski chase for a catnapped cat would be exhilarating and exciting. Leth's script in "Roll With It" feels a bit more lighthearted and Ford's art style is a great fit tonally. If you're into Jem and the Holograms or just want a book that's not too serious, then definitely check out Jem and the Holgrams: Dimensions #1. Jem and the Holgrams: Dimensions #1 is available now.